In the 10 years between the founding of C&C Yachts in 1969 and J-Boats introduction of the J/30 in 1979, it is fair to say C&C Yachts, of Ontario, Canada, ruled the waves when it came to the design and production of performance-oriented cruising sailboats. The C&C 35 set the benchmark for what was to become known as the cruiser/racer and, to a large extent, the C&C 35 was responsible for establishing C&C Yachts as one of the major production sailboat builders of the 1970s. The original C&C 35, also known as the Redwing 35, was a further development of the Invader, a 35’ design by Canadian designers George Cuthbertson and George Cassian, the two "Cs". The boat was introduced in 1969 but at the end of the 1973 production year, some significant design modifications were made. Boats built in and before 1973 became known as MkI models, and post 1973 boats were designated MkII models. In all, 351 C&C 35s were built, and production ended with the 1975 model year. Although both versions share the same "designated" length, as well as many other similarities, there are a number of significant differences between the two models. Most notable, perhaps, is the overall length. The MkI measures 34’7" overall while the MkII measures 35’6". The nearly one foot increase in length of the Mk II is a result of raising the sheer several inches. In addition, the scimitar-shaped rudder of the MkI was replaced with a more conventional, partially balanced spade. The after sections of the MkII were reshaped to reflect the then-current IOR design trends, sail area was increased by a little over 50 square feet, and an additional 620 pounds of ballast were added. The deck and cabin house of the MkII were also modified eliminating the integral sprayrail on the cabin top that was a prominent feature on the MkI. The cockpit was changed to a "T" configuration, and a bridgedeck added for the mainsheet. The interior was spruced up to make it a little more yacht-like in appearance and, last but not least, all these changes resulted in a 30 % increase in displacement to 13,800 pounds, and draft increased from 5’ 3" to 5’ 6". Even with all these changes, the MkI and MkII bear a strong resemblance to one another, and performance measuring parameters changed very little. For example, the displacement-length ratio changed only two points, and only five points separate the average PHRF base ratings of the MkI and MkII models. Construction of the 35 is a solid FRP hull with composite decks utilizing a balsa wood core. Construction is generally strong, although secondary bonding failures are found from time to time at structural bulkheads, particularly on boats that have been raced hard. Leaks are common at the deck-to-hull joints and around cabin windows. The keel is bolted with stainless steel bolts and nuts, although some boats had steel washers that, if found, should be replaced with stainless steel washers or plates. The accommodation plan changed very little between the MkI and MkII models, but the décor of the Mk II is more modern in appearance. Both have V-berth cabins forward followed by a port side head. The main salon follows with a port side dinette that converts to a double berth and a starboard settee/berth. The galley and navigation station are flip-flopped on the two models with the MKI having a starboard side galley aft and a port side quarter berth/navigation station combination. The galley is a little larger on the MkII version. Both models have a fiberglass cabin sole and minimal bilge area. The Universal Atomic 4 gasoline engine was the standard auxiliary power for both models. Some of the later MkII models were offered with Westerbeke diesel engines, and some may have been built with Universal diesel engines. I have seen several boats retrofitted with both Universal and Westerbeke diesels although it’s hard to justify the cost if the old Atomic 4 is still serviceable. Both models are generally regarded as good performers. In her day, the MkI version was very competitive in IOR fleets, although the MkII never quite measured up to expectations or rating. The MkI, particularly, seems to excel in light air. However, with her smallish rudder, she is a bit tricky to handle downwind in a strong breeze. It is still common to find these venerable old boats out on the race course, racing under the PHRF rating system, some still doing quite well. 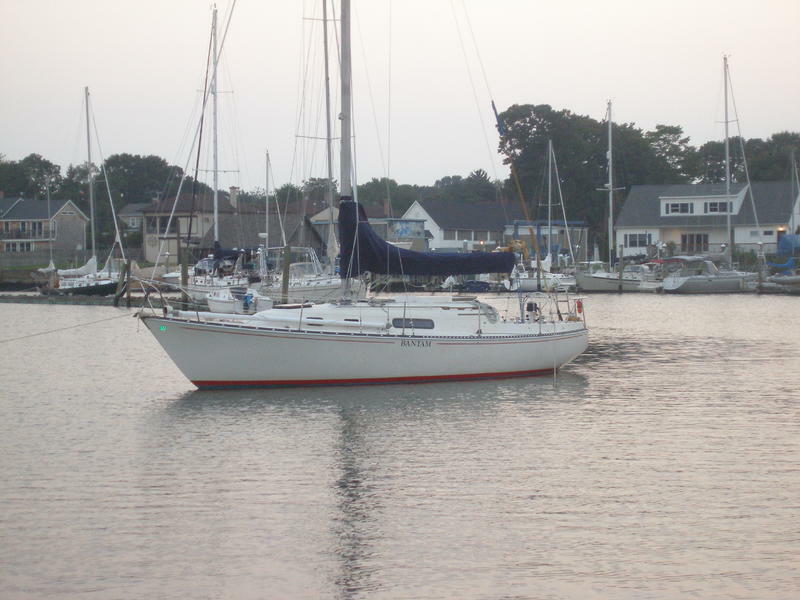 In the 1997 Annapolis to Newport race a local C&C 35 MKI, circa 1971, named Sanderling was the oldest boat in the fleet, yet she finished an impressive third in class and third in fleet. There are usually several 35s available on the market between the Chesapeake, New England, and the Great Lakes area. If you decide to shop for one of these models, you should keep in mind that this is not the only 35 footer C&C built and it can get a bit confusing. From 1983 to 1987 C&C built another 35 model sometimes referred to as the C&C 35 MKIII, and from 1981 until 1985 they built the C&C Landfall 35. Neither of these boats bears a resemblance to the older MkI or MkII and should not be confused with them. If you’re in the market for a 35-footer, this is a boat that’ s worth a look.